Nutritious liver detox smoothie with apples, spinach, banana, carrot, parsley, turmeric, lemon, walnuts, and hemp protein powder. This healthful, filling smoothie is packed with everything you need to help cleanse and revitalize your body. I always like to start the New Year with a smoothie recipe or two to help clear out any over-abundance we may have entertained during the holidays. …And also, who doesn’t love a great, nutritious smoothie? You may have noticed, I like to give a theme to each of my smoothie recipes. 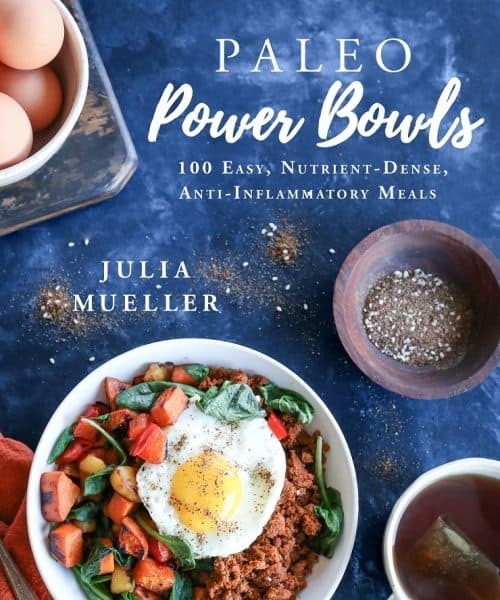 For instance, the Immunity Boosting Tropical Smoothie, Good Digestion Smoothie , Anti-Inflammatory Smoothie, and Aphrodisiac Smoothie recipes I’ve posted in the past do just what their titles suggest. And now? It’s time to detox our livers. I know, not exactly the sexiest topic in the world, but bare with me here, because this stuff’s important. We typically don’t think about each of our organs when we’re sitting down to a meal with family, are going out for a night on the town, or simply making day-to-day food choices. It’s easy to overlook the parts of our body that aren’t immediately obvious, but the liver serves some pretty important functions. Storing vitamins, minerals and glycogen, removing toxins from your bloodstream, producing bile to digest fat and break down hormones, balancing protein, fat and sugar in the bloodstream, and eliminating old red blood cells are just a few of its many functions. Some tell tale signs that your liver isn’t working as well as it should is if you experience bloating or gas, constipation, heartburn or acid reflux, anxiety or depression, have a difficult time losing weight, experience chronic fatigue, excessive sweating, and more. So basically, if your liver’s pissed, other systems in your body will react to let you know something’s up. When we think of liver damage, we typically think of excessive alcohol consumption, but it’s entirely possible to have an improperly functioning liver without drinking. Common causes of liver damage are eating processed foods (in particular, hydrogenated oils and refined sugar), alcohol consumption, having autoimmune disease, taking certain medications, not getting the proper nutrients from your food (malnutrition), and more. 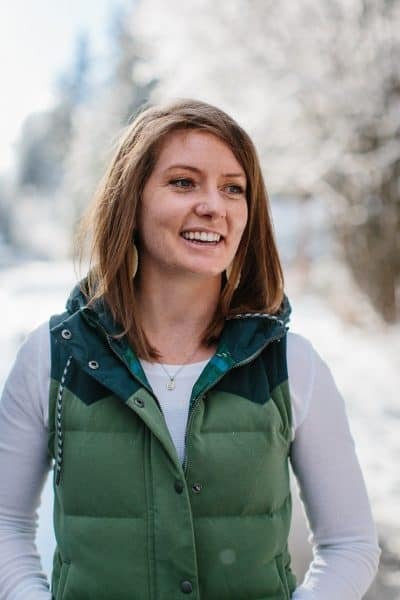 In this sense you can see the importance of taking a load off your liver, throwing it a metaphorical bone to help it do its job more efficiently so that your overall health is in tip top shape. Step 1 in your liver detox journey is to remove processed foods from your diet, and add foods that support and detoxify your liver. 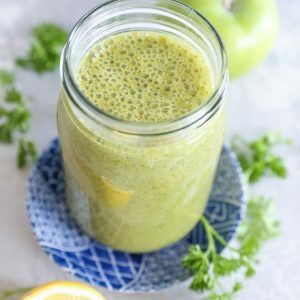 Foods like the ones you see in this smoothie recipe will help you get rid of toxins and will nourish your organs so that they aren’t overly taxed. Your goal is to lower systemic inflammation by removing pro-inflammatory foods from your diet, and instead incorporating anti-inflammatory foods. We’ll discuss the cleansing properties of this smoothie in a moment, but I want first to discuss the protein component. 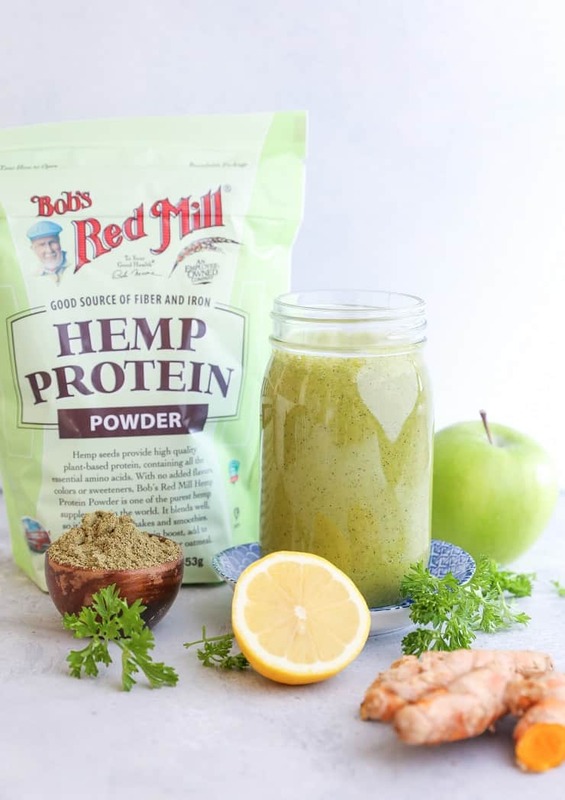 I used Bob’s Red Mill’s Hemp Protein Powder in this smoothie to give it a plant-based protein boost, making it a well-rounded meal-in-a-glass, or excellent pre or post-workout snack. If you look at the ingredient list on the back of the package, the only ingredient is hemp protein powder. No added anything, no sweeteners, artificial flavors, etc. For me, this is key in choosing a protein powder, because I feel everything but the protein is unnecessary. The powder blends easily in smoothies and can also be incorporated baked goods, pancake batter, and/or oatmeal. I’ve mentioned this is past posts, but I learned a few months ago that I wasn’t consuming enough protein, so I’ve been hyper-vigilant about my intake. While I do eat animal protein, I like to derive some of my protein from plant-based sources as well. Since I have a sensitive digestive system, many protein powders mess with me, but Bob’s Red Mill’s hemp protein works like a charm! Adding it to a smoothie or energy bars/bites is an effective, easy-to-process form of protein. Apples: Contain a good source of pectin, which is necessary for the body to cleanse and release toxins from the digestive tract. In this sense, apples help the liver handle the toxic load. Bananas: Potassium is essential to keeping your liver healthy and it’s also imperitive for cardiovascular health, lowering bad cholesterol, and lowering systolic blood pressure. Psst! Sweet potatoes are an even better source of potassium than bananas! Walnuts: Walnuts help the liver in detoxify ammonia, and are also high in glutathione and omega-3 fatty acids,which help keep the liver clean. Walnuts are best consumed when liquified to make them easier for your body to digest, so adding them to a smoothie is quite brilliant! Parsley: Contains a high concentration of vitamins, minerals, antioxidants, enzymes, chlorophyll and volatile oils, all of which support healthy liver function. Parsley, along with other fresh herbs, is known for its awesome liver and kidney support. Lemon: High in vitamin C, which helps the body break down toxic materials into substances that can be absorbed by water. Turmeric: Turmeric assists enzymes that actively flush out dietary toxins, making it a powerful anti-inflammatory and antioxidant. Spinach: Extremely high in chlorophyll, leafy greens soak up environmental toxins from the bloodstream. They neutralize heavy metals, chemicals, and pesticides and also help protect the liver. Cinnamon: I love adding cinnamon to my coffee and smoothies both for flavor and for improved blood circulation. While cinnamon isn’t known for its liver-cleanse properties, I adore its circulatory benefits. More liver cleanse foods that I didn’t include in this smoothie are papaya, beets, artichoke, asparagus, kale, and Brussels sprouts, cabbage, lime, avocados, green tea, grapefruit, and garlic. Feel free to play with your smoothie ingredients and perhaps consider adding papaya, beets, avocado, kale, and/or grapefruit. If you’re intolerant to bananas, consider adding 1/2 cup papaya or ¼ to ½ a cooked (and cooled) sweet potato in lieu of the banana – as it turns out, sweet potatoes are an even better source of potassium than bananas, so you can’t go wrong by making the switch! What else can you do to help detox your liver? Drink raw vegetable juice (think leafy greens and beet juice), make sure you get plenty of B vitamins, Vitamin C and iron in your diet, take a milk thistle supplement and/or a dandelion supplement, and/or consume beef liver or take a liver supplement. Whether you went off-the-charts bonkers with alcohol and food during the holidays or not, being mindful of your operating system is a sure way to maintain health long-term. So there we have it! 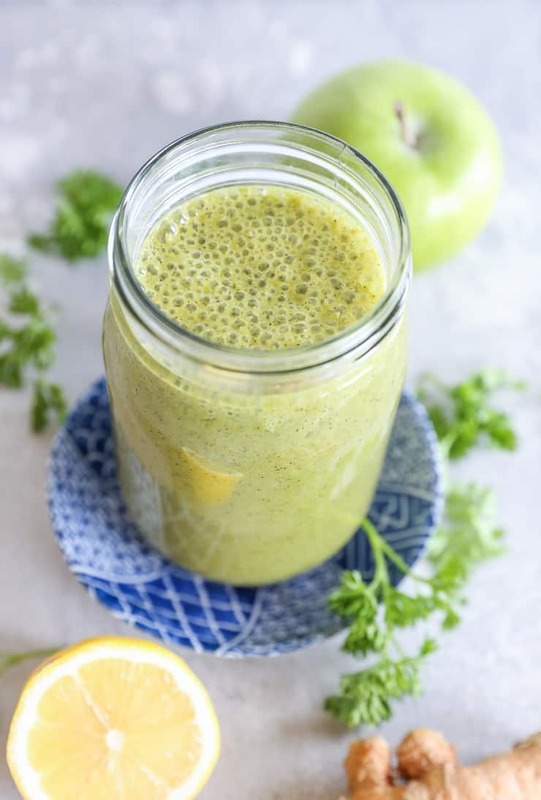 A smoothie that fills, nourishes, detoxes, and revitalizes! Pour it in a pretty glass, sip it out of a fancy straw and feel your liver (and the rest of your body) thanking you for the vacation. *Replace banana with 1/2 cup chopped papaya if intolerant to banana. Papaya is a powerful antiparasitic and also aids the liver. You’ve got me convinced that I need to work on detoxing my liver after reading your list of symptoms (and I did drink too much vino over the holidays)! This post was very educational and I’ll do better to take care of the old liver. This smoothie will make it easy — I’m totally going to try it! I need all the detox I can get considering that I ate 1.6 bajillion cookies in the last month. I love all of the goodness in your version, like fresh turmeric and parsley. I know I’d be feeling great after one of these and boys! Love this! 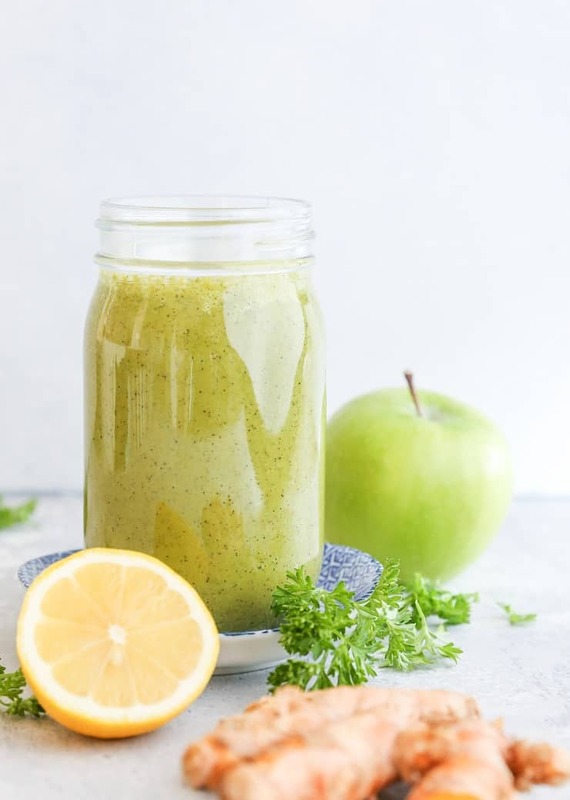 I’ve been working a lot on including liver detoxing foods since this past fall when I did a three-day detox program before my wedding, and this smoothie will be a great way to keep it going! I’m eager to try the hemp protein powder since I’ve never had it before! I’m so happy I found this post. I typically quit drinking for the month of January so your smoothie recipe will really give my body the cleanse it needs. I’m on a smoothie kick right now so I’ll be pinning this recipe as a reminder to make it next week! how often do you drink one? Do you drink this everyday? And if so for how long ? I like to throw in a hand full of Goji Berries too. That sounds amazing…I’ll have to try that, myself! Thanks, Jody! If I can’t find raw turmeric, Is it ok to use ground turmeric instead? Yes, absolutely! I would do 1/8 tsp to 1/4 tsp ground turmeric. Enjoy! The smoothie is amazing but how long do I take it for ? My daughter who is 30 is having high ALT and I am worried. She is going to have another blood test in a month. Can this smoothie help her lower them? Please help.